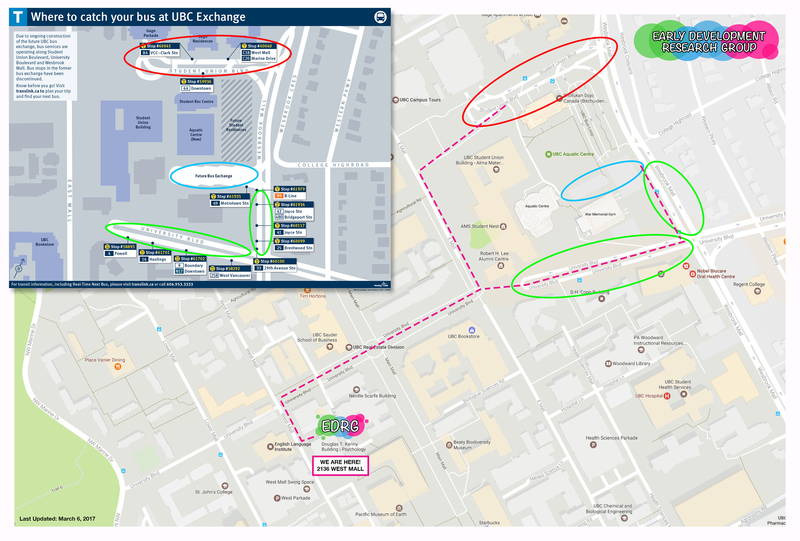 If you arrive at the New Bus Exchange (blue on the map below), walk south along Wesbrook Mall until you reach University Boulevard. Turn right onto University Boulevard and continue four blocks, past the Martha Piper fountain, until you reach West Mall. If you arrive at Student Union Boulevard (red on the map below), walk towards East Mall and take a left. Walk along East Mall until you reach University Boulevard. Turn right onto University Boulevard and continue four blocks, past the Martha Piper fountain, until you reach West Mall. If you arrive at University Blvd or Wesbrook Mall (green on the map below), walk west on University Boulevard (into the heart of campus), for three blocks, past the Martha Piper fountain, until you reach West Mall. Take a left on West Mall and the Douglas Kenny Building is the second building on your left side. Enter the Kenny Building at the ground level (there is a ramp for strollers) and follow the signs directing you to the Infant Studies Centre in room 1401. Please note that the Kenny building is locked after 5 pm and on weekends. Therefore, if you are scheduled for a visit during these off hours, we will have a research assistant waiting to meet you at the front entrance. If you have any questions, please don’t hesitate to contact us at 604-822-6408.